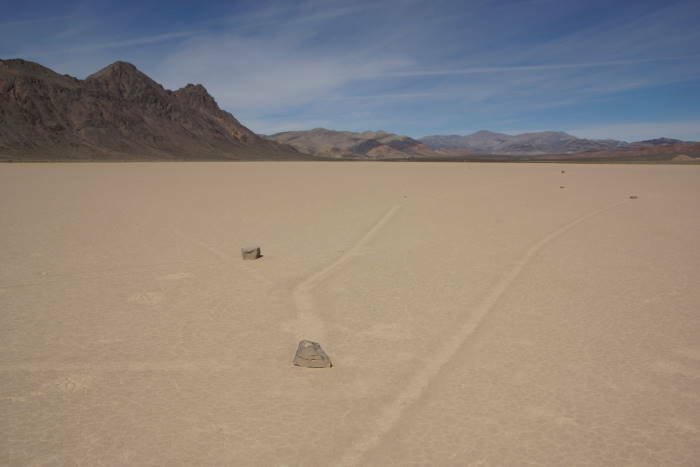 Visitors to Death Valley can observe a remarkable phenomenon: rocks that appear to be capable of sliding along a dry lakebed, all by themselves, leaving paths in the dirt behind them. 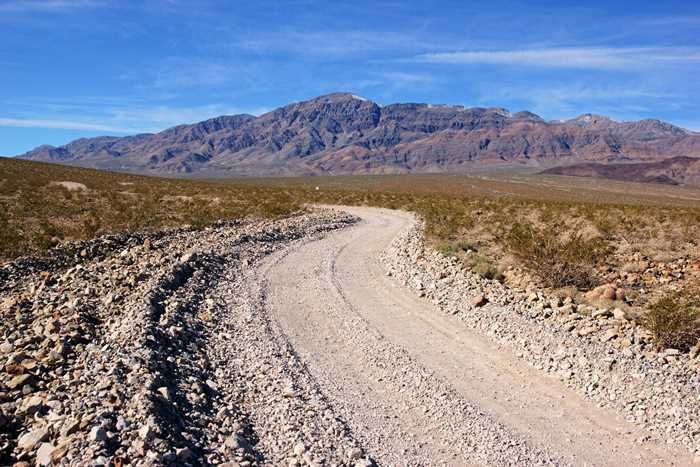 Unfortunately, there is just one way to see the evidence for yourself: to get to the “Racetrack”, as it is known, you must drive down a very long, very bumpy dirt road, into a remote corner of an inhospitable land. I’ll tell you all about the rocks on a separate page. This story is all about that drive. If I had been paying attention the first time, I wouldn’t have had to do this drive a second time. Back in 2009, during a visit to Death Valley, I made the drive to the Racetrack. It was brutal — so much so, that when I reached the first parking area at the playa (dry lakebed), I swore that I couldn’t take anymore. I got out, looked around, but really didn’t see many roaming rocks. And then, I was so anxious to get the drive over with, I left. This was a mistake, because the vast majority of the Racetrack’s roaming rocks are at the southern end. I even took a picture of a sign that told me such. Fast forward seven years, and here I was again, with a 4-wheel drive vehicle, and a desire to do it right this time. The long, rough ride to the Racetrack begins when you say goodbye to the pavement. 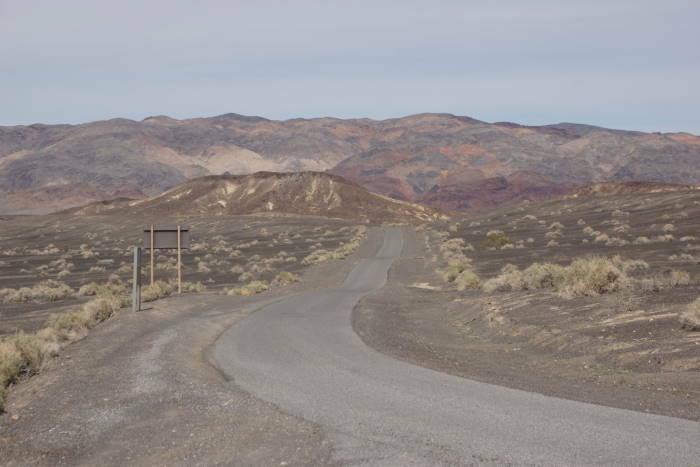 This one-way loop road provides access to Ubehebe Crater. 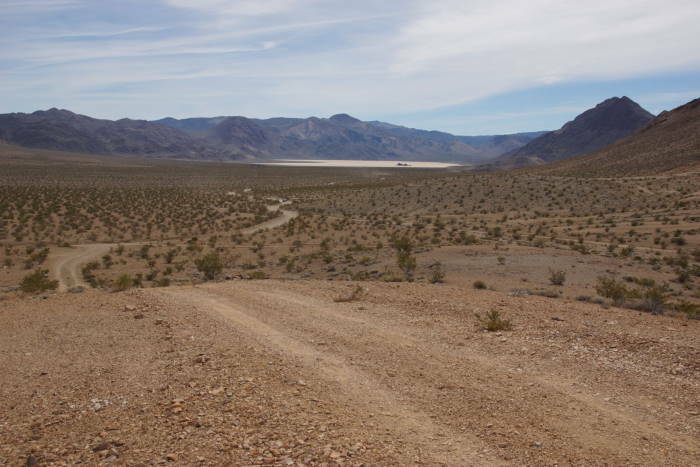 Shortly before you get to Ubehebe’s parking area, the road to the Racetrack turns off, and the adventure begins. On my first visit, I was driving something like a RAV-4 mini-SUV. I thought the road was going to rattle it apart. This time, I had a Jeep SUV — not a Jeep Jeep, but still, it was a sturdier vehicle. I didn’t worry as much about the vehicle this time, but the drive was still exhausting. In order to get to the Racetrack, you have to go up to a pass and down the other side. 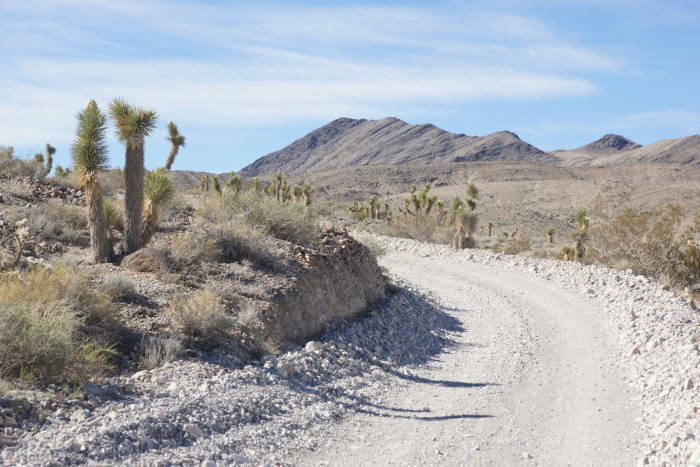 When you get up to the highest point, you’ll pass through a nice little Joshua Tree forest. … most of them customized just for this purpose. 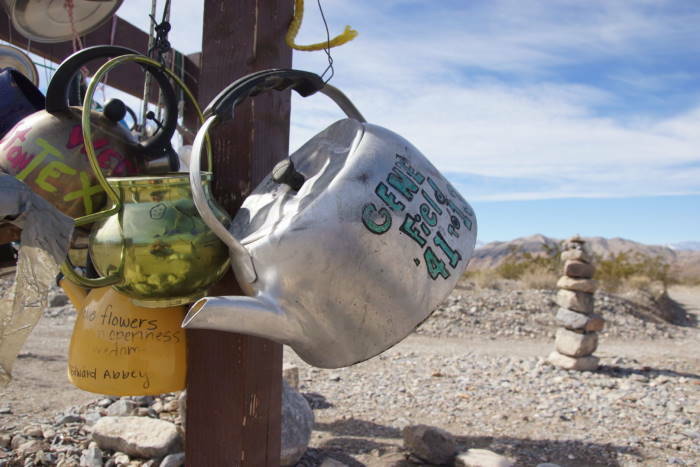 All of the teakettles I saw were dated 2015 or 2016, which leads me to believe that the park takes them away after a while, allowing room for new ones. If they didn’t, there would likely be hundreds of teakettles here, instead of dozens. 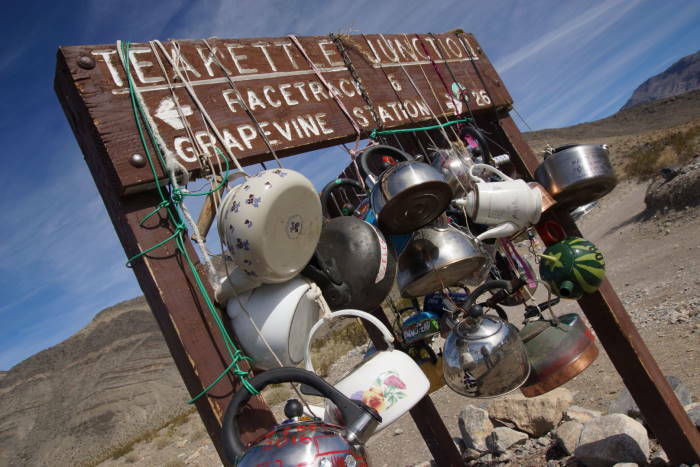 You’re already headed downhill when you reach Teakettle Junction, with about six miles to go to the Racetrack (seven miles, if you’re going all the way to the southern end, and you darned well better go all the way). The playa begins to appear on the horizon. For a better look, watch for this obvious side road, which leads up a nearby hill. While it’s imperative you go all the way to the south end of the lakebed, it’s also a good idea to stop at the north end. Here, you can walk out on the playa to the “grandstand” — a pile of rocks in the middle. I must tell you, it’s a remarkable feeling to walk away from your car and onto the flattest natural surface on earth. I felt very tiny. 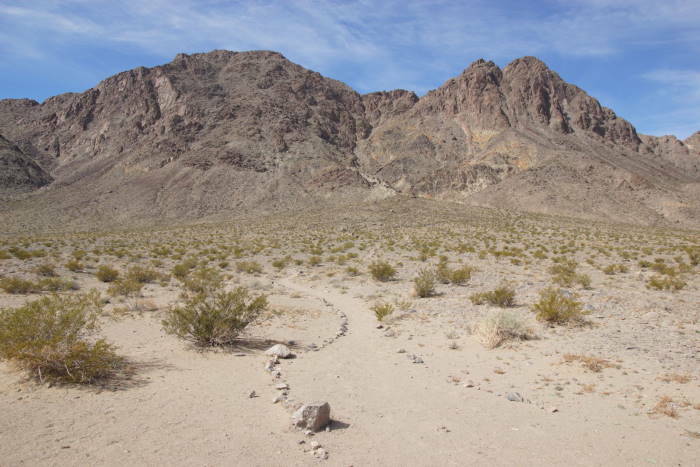 There is also a trail at that northern parking area, which leads up to the top of Ubehebe Peak. It’s a 3-mile, one-way hike with an 1,800 foot elevation gain. That sounds like a lot of effort, especially in the Death Valley heat. But I’m sure it has a great view of the Racetrack. When you finally make it down to the southern end of the Racetrack, take another long walk out onto the playa. 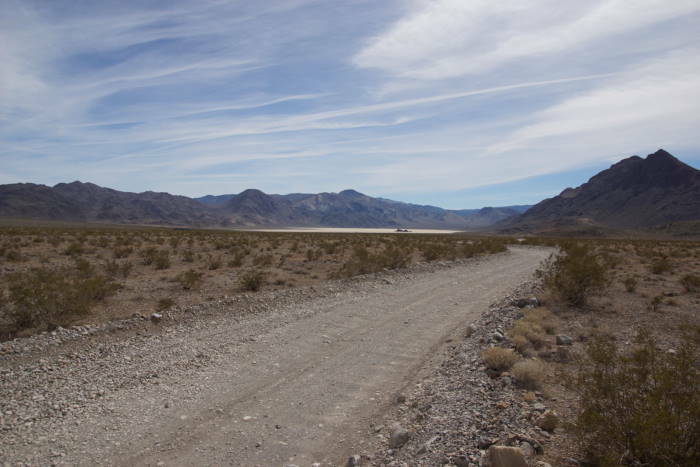 You’ll find the most sliding rocks on the far corner of the lakebed. I’ll show you much more on a separate page. And when you’re done, get back in the car and drive all the way back, the way you came. 27 miles of gut-jarring bumps and vibrations. Then call it a day. You earned it. The Racetrack is absolutely worth the time and effort it takes to see it. But, you need to take this drive seriously. Make sure you have a vehicle that can handle sharp rocks and washboarded surfaces — not just for a mile or two, but for a total of 54 miles, round-trip. Allow plenty of time, and make sure you have plenty of food, water, and a good spare tire in the trunk.